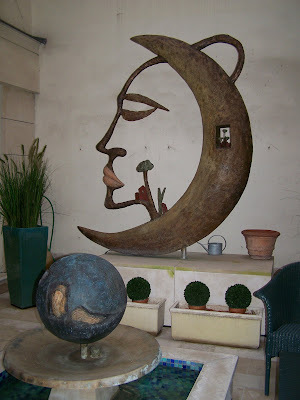 Not sure if this lovely sculpture in the courtyard of the Luxembourg Parc Hotel in Paris qualifies as a statue. When is a sculpture a sculpture and when is it a statue? Anyway, it's by Antonio Nocera and it's very beautiful. When I was a child one of the games we played at parties was musical statues. This man on the South Bank in London reminded me of that game. A real musical statue! Hey, I asked that very same question today! Great minds, Betty . . .
great idea to put in a living statue!! i always liked playing statue as a kid ---- freeze! oh I guess that's the wrong thing to say considering the weather. I like that top one a lot. As for the second one, I bet their houses are dirty with handprints everywhere! Very interesting question. What is the difference, location? Last year I saw intriguing living statues all along Las Ramblas in Barcelona Spain. The Nocera work is stunning! As for the definition thing, like you I kind of expanded the envelope more than a little. Oh well, Kim told me a while a go that there are no real rules to these things. Heh, heh! Love your pictures..especially eh blue man! Did he blink? letty - It was summer when the photo was taken, but certainly a living statue today would be very blue! Brrr! kimy - he he! the skies have been blue here today, too. kris - hello! 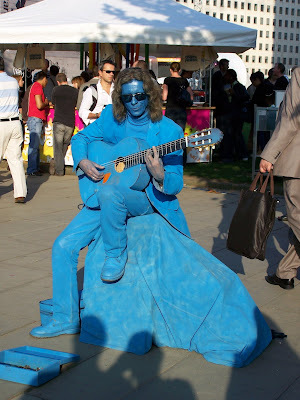 I would love to know whether he painted himself blue, or if he got someone to help. Dakota Bear - Barcelona is on my 'must see' list! Roy - the Nocera took my breath away. Will go see it again next time I'm in Paris. Had never come across his work before. He's a gifted illustrator as well as a sculptor.